DAP v4.0 is now out of beta. UPDATE 1: Spanking New Feature: "Dime Sales"
This is a rocking new feature that will allow you to have "Dime Sales". Basically, a "Dime Sale" is where you configure the price to go up every "X" sales. We've taken this one step further, and allowed you to hike up the price every "Y" days too! And of course, the price hike is not restricted to just "dimes" (10 cents). When you use the new built-in Paypal buy-button generator, you now have the ability to redirect the buyer to any thank-you page URL after successful purchase. In the first update, this was hard-coded into the button and you had no control over it. Now, thanks to a new Config item, you can set the URL to which user is redirected AFTER Login-Xpress happens. So "Login Xpress" will still happen, and user is automatically "logged in" to their members area right after purchase. But now, you just have the added ability to redirect them to a custom URL, after they've been logged in. This new config setting will over-ride both the Product-level and the Global Config-level "Logged-In URL" fields. We've updated the new DAP Shortcode framework to include the ability to specify a "Day" right within the shortcode itself. So you don't have to use the DAP Products page just for specifying the dripping. You can now simply specify the dripping "Day" as a parameter in the DAP shortcode itself. Which leads us to an extremely powerful new benefit: "In-Page Dripping". So you can now publish, say, 10 videos on one page, and you can enclose each video's embed code with a separate DAP Shortcode that has a different "Day" setting, so the very same page will show 1 video on Day 1, 2 videos on Day 2, 3 videos on Day 3, and so on. Let's say you run a coaching program. You have 10 clients. You want to provide custom reports to your clients, and you want to publish those client-specific videos or PDF reports on your blog, and you want only those specific clients to see content that is meant for them. And you want to drip the content. So you want Joe Customer to see a tailor-made custom video meant only for Joe, and Jill Member to see a specific PDF report written specifically for Jill's business. Now using the new "userId" parameter in the DAP shortcode, you can now protect a piece of content so that only a specific DAP user can see it. We have now added coupon support for recurring products too. So now you can set a separate discount amount for 1st /Trial payment, and a separate discount amount for Recurring Payments. This basically extends the existing Product Chaining feature such that you can now set up a product chaining to occur in the "future" (rather than always happen "now", like it was earlier). This gives you the ability to, say, give a member access to a bonus product "X" days after the purchase. You can even use this feature to trigger an automatic move from one product to another after "X" days. UPDATE 3: Button-level "Return URL"
The "return_url" is now set within the DAP-generated Paypal button. So as long as "Auto Return" is turned "ON" in your Paypal account, it doesn't matter what "Return URL" you enter in that field within your Paypal account. You can enter any generic URL there, in case you are using your Paypal account for multiple web sites. All of this is part of DAP v4.0 (beta) and LiveLinks v1.5 (beta). Both are available for download now. If you have already downloaded and installed DAP 4.0, then see this blog post on what you need to do to get these updates. Support for member's Primary Email being different from their Paypal Email. Multi-Tier Affiliate: Create unlimited affiliate tiers. Extremely simple to set up. Example 1: Shows content to ONLY logged-in user [DAP]protected content here[/DAP]. Example 2: Shows content between the shortcodes to only a PAID user who has access to Product Id 1. [DAP isPaidUser="Y" hasAccessTo="1" errMsgTemplate="SHORT"]protected content here[/DAP]. Capture & Display of "Destination URL" for affiliate links, to answer the question: "To which page on my site are my affiliates sending traffic to?" DAP v4.0 and LiveLinks v1.5 are both available for download from the member's area. PS: Wishing you an amazing new year! And don't forget to comment below. Cheers! WOW … thank you both , you are the DREAM TEAM for membership site creation! What an exciting release, and I am sure in 2011 you will surprise us again with even more cool features! This is really great. I thank you for getting the coupon going. The in page drip is a nice feature too. For the paypal generator button, is it possible to have a config item added that will allow us to upload a button graphic of our choice, rather than using the standard paypal button? I believe this would be easier than change the button source in the button code. I have to really dig in and study all these new features. So much to learn. Love that you’ve added the In-page drip feature. That will come in handy for my new opt-in offer I was planning. Thanks for this cool update. At times, It becomes difficult to find out exactly which beta version we have and which beta version is present in the members area for us to download. Thanks everyone! Love all your comments :-). It motivates us to do even better. Yes, we hope to keep the Internet Christmas going for a while! >> For the paypal generator button, is it possible to have a config item added that will allow us to upload a button graphic of our choice, rather than using the standard paypal button? I believe this would be easier than change the button source in the button code << << Good question. For now, you can update the button source to change the graphic but we will add the config option in the next button-generator upgrade. Matt, If you updated successfully, you will now see a Dime Sales link under the Payments/Coupons Menu. Molly, If you would like to pay by Paypal, you can send the payment to our paypal account - dap-AT-digitalaccesspass.com (replace -AT- with @). Yes, I see the Dime Sales link. Wow, DAP just keeps getting better! Love the features you’ve been adding the last couple months… the price increment feature! The coupons, the ClickBank INS support… awesome. I just updated both of my sites to 4.0. I needed to go into the WordPress admin to finish the update but no error messages and at this point everything looks like it is working great. Cool. Thanks Chris for the update. We do not normally add features after beta is released but these features were so awesome, we just had to release them so DAP users could benefit from it. But you make a great point. We will keep it in mind for our next release. We do not have text documentation on the Paypal button generator yet but the video that you see towards the top of this post covers all the config / setup details. Just 24 hours ago I asked if it was possible to implement some features … and you have the added immediately! PS: I do not want to overdo the requests, but I might suggest something else (but this time I do not know if it is actually possible)? I want to implement in my business a “mini-launch” for each prospect who signs up to my mailing list. Also called “Perpetual Launch, using another great software (great! ): OptimizePress. you can find the way that everyone who signs up in the DAP through the squeeze page, it sees the sales letter with the payment button generated within the DAP, WITH “DIME SALES” ACTIVATED, INDIPENDENTLY FOR EACH NEW PROSPECT, always starting from a minimum up to a maximum price, for example, within one week? We have already added coupon support for subscription button. As far as SSS is concerned, it is our top priority for the next DAP release (4.1). We will probably have the beta out in 6 weeks from now. Implementing dime sales at user level is very complex. It’s not something that we can add to DAP anytime soon. Right now the price increment applies to all months.. but yes, in the next upgrade we can make it configurable where the admin can decide whether they want it to apply to just the first month or all recurring payments. I would love to be able to create different affiliate links that lead to different pages on my site within the Ready-Made Affiliate Toolbox. What I envision being able to do is set up special [%%AFF_LINK%%&p=http://www.MyDomain.com/MyPageOfChoice] in the admin area that lead to the given page and create a special affiliate link. Then, in the Toolbox you’d use your special affiliate link [for example %%AFF_LINK_01%% or %%AFF_LINK_02%%] without having to append the URL. This way, if you’ve set up 20 or 30 ad options with a given URL and you want to change the URL redirect for those particular ads, all you have to do is change it once in your admin area instead of 20 or 30 times throughout your Toolbox. It’s definitely not a vital function, but it would be nice :). can have a URL Redirect Thank-you, not on a general level but for every single product? You can implement this feature? Yes, it’s possible and it’s already in our plans. It will be part of the next DAP 4.0 beta update.. likely in a day or 2. The affiliate toolbox is just one page and it’s already customizable with the affiliate links.. so another config on top of this just to avoid pasting the link once or twice on the toolbox page is too much work and probably won’s happen anytime soon. Fair enough :). I’m currently using another affiliate program to manage about 150 marketing links leading into 13 different campaigns within the same program which is where this thought came from. Within that program, I am able to change many different marketing links at the same time using a bulk change feature from the config file and it’s really convenient. I can understand, though, that if most people only provide one or two links in their affiliate toolboxes then it wouldn’t be worth it. I can continue using the software that I’m using currently. Once you’ve added the admin-defined hidden fields in the HTML forms for DAP, I’ll be able to integrate the two programs anyway. It was just a thought :)…would be nice to simplify and only use one program and on EVERYTHING else, DAP is far superior! I would like to have a required field or button so before an affiliate will be paid they must agree to the affiliate terms & conditions. Is this possible? Veena–I am loving the shortcodes. Have been experimenting with great results. Can I use the shortcode somehow to show a message only to NOT logged in? For example, I have added a message to my Login page, “Not yet a member?” and then give them a teaser and a link to signup. I would love it if I can hide this message once they are a member. Wondering if you have on the drawing board the capability of emailing an affiliate when they make a sale? >> Wondering if you have on the drawing board the capability of emailing an affiliate when they make a sale? << We will add this feature to DAP 4.1. >> Can I use the shortcode somehow to show a message only to NOT logged in? << DAP 4.1 (next dap release) will support the ability to say 'isLoggedIn=Y or N' in the shortcode. Any tentative dates for final DAP v4.0 release? Suggestions for the Dime sales feature. Add a percentage price increment option to allow the sales price to increase by a percentage with every sale. Also, a question. If three units are purchased with one sale, will the price increment 3 times or just once? In my case, I need the price to increment 3 times, as in once for each unit sold. I have one question regarding PayPal button. When I generate such button, can I place it everywhere I want to? What I mean is to have button placed on another domain with different product, but still have processed through main website where is installed DAP. This way I can have secure downloads with time set how long download is available. In RAP they have add on button generator which can be placed everywhere I want outside RAP, but still every purchase must be processed through RAP. I’m now 99% ready to go ahead with DAP. By the way, you have new OTO upsell in DAP, why do we need SSL? >> I have one question regarding PayPal button. When I generate such button, can I place it everywhere I want to? What I mean is to have button placed on another domain with different product, but still have processed through main website where is installed DAP. < < Yes, the button can be placed anywhere you want, on any site. The main thing is that the product that you are trying to sell via that button must be defined in DAP and the Paypal IPN pointed to DAP so DAP can create membership record upon successful purchase of the product. >> By the way, you have new OTO upsell in DAP, why do we need SSL? << SSL is required for 1-click upsells as security-sensitive data is collected (Credit card info etc). This is what I wanted to hear it. One more question. Let’s say I have my DAP installed on my main domain aim.com bit button is placed on, let’s call it eBook.com. Will buyer be redirected after purchase to my main website aim.com/Thank You page or I have to install next DAP on ebook.com in order gor buyer stay on domain eBook.com/thank-you? >> Letâ€™s say I have my DAP installed on my main domain aim.com bit button is placed on, letâ€™s call it eBook.com. Will buyer be redirected after purchase to my main website aim.com/Thank You page or I have to install next DAP on ebook.com in order gor buyer stay on domain eBook.com/thank-you? << The buyer will be redirected after purchase to your main website aim.com/Thank You page. You do not need to install DAP on ebook.com in order for buyer to stay on domain eBook.com/thank-you. What I want is to have people in my membership area and be able to download secure whatever they purchased. I don`t want to spend for other programs to make secure and expire able downloads. DAP is really good option even though secure downloads are only available in member`s area. Am I correct? Hi Veena. I am really excited. I WANT DAP WITH KUNAKI INTEGRATION. WHEN DO YOU THINK YOU CAN DO THIS? This will complete the DAP metamorphosis. It will make it an instant winner hands down. Dont even think twice, go ahead and throttle this winner to new heights and I and many already using many using other scripts will come to the party! Please..in the new upgrade!!! Kunaki is on the top of my request list too…. Kunaki is at the top :-). It’s a lot of work to integrate with Kunaki from our earlier review of Kunaki but we will take another look at it and maybe… if goes well, we will add it to DAP 4.2. DAP 4.1 (beta) will likely be released tonight. What’s your best guestimate on when 4.2 will be released? I’m waiting with baited breath for the custom fields in the form that’ll be in that one…(mostly patiently ;). Thanks as always for your diligent, tireless work, Veena and Ravi. I look forward to 4.1. No worries… custom field support will certainly make it to dap 4.2… we will let you know as soon as the beta is ready for testing. I think DAP 4.2 will be out in 6 weeks from now. Awesome!!! I can wait six weeks. Thanks for the time frame…gives me a chance to plan the changes I’ll be making to my company when 4.2 is available. You are one of my very favorite people, Veena :). Integration with Kunaki is the real pearl of great price, real sweet music to me, can’t wait, myself , Kaan and a whole lot of Veenanites out there. We are waiting with baited hands! Throw us the party will you! The waiting kills! Regarding the dime sales feature. Pretty cool. It would be great to not only be able to have the price increase each day but do it for any time period we’d like. For instance I’d like to set it so the price goes up every hour not just once per day. I believe this would be much more compelling in terms of the scarcity aspect. Ideally any time period we want should be able to be set. 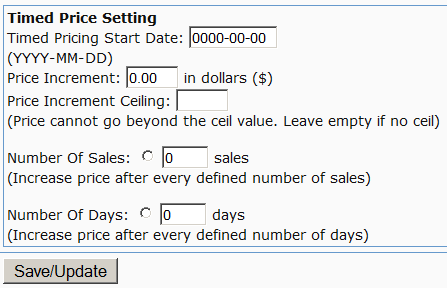 You can set the price to increase after a given number of sales or given number of days. In a future release of dap, we will add more options like the price going up every hour and not just days.